The Stink Bomb Refreshing Spray from Animology reduces bad smells on your dog and helps to keep the coat clean and fresh. Contains conditioner and Pro-Vitamin B5. Animology sprays are specially formulated to meet specific needs. Each contains a conditioner and added Pro Vitamin B5. These contribute to health, strength and coat condition. Stink Bomb Refreshing Spray helps reduce unpleasant odours that your dog carries, and can be used on any type of fur. It helps to keep the coat clean, with a fresh fragrance. Stink Bomb Refreshing Spray is easy to use thanks to the handy spray bottle and has a balanced pH. Use between washes. Spray the Stink Bomb Refreshing Spray on your dog and comb it through without rinsing. Make sure no spray gets into the dogs eyes. Should this happen, rinse with clean water. 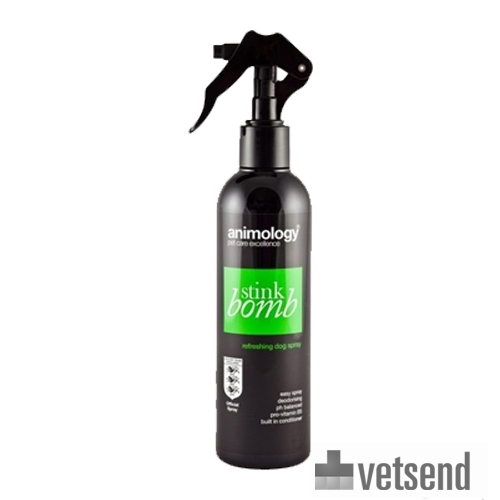 Have you used Animology - Stink Bomb before? Let us know what you think about this product.